The Edge of Paradise is a true gem and a one of a kind tropical getaway villa. 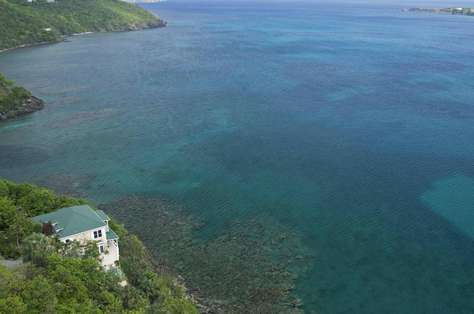 Nestled on the edge of world-renown Magen’s Bay in St. Thomas, it is a combination of charm, luxury and privacy. This property has 4 Twin(s), 2 King(s), 1 Pull Out Sofa(s), 1 Queen(s). We just came back from a dream vacation with our best friends. We have spent over 20 years vacationing together, but nothing compared to this trip. The home is beautifully decorated and offers all the comforts of home; there was room for 4 couples with bathrooms to spare. 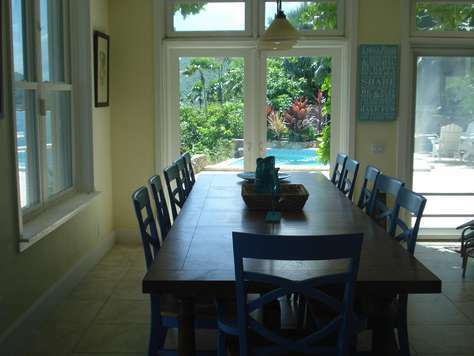 The kitchen is large and open, which allowed us to cook together, then eat at the HUGE table that sits 12. We were lucky enough to stay in the cottage, where every night we were lulled to sleep by tree frogs and the lapping of the ocean on the rocks. The area was filled with natural beauty, we hiked, kayaked, fished and snorkeled all from the convenience of the villa (no driving necessary). In the morning we observed iguanas basking and sea turtles swimming in the coral beds directly below the house. On the last day of our vacation as we sat out on the deck watching the birds and ocean it began to rain, for just a moment…then a huge rainbow appeared that started near Megan’s beach, and ended in the ocean just in front of the house!! We have spoken to several people who have visited St. Thomas and described how beautiful Megan’s bay is, and how they found it to be the favorite part of their vacation. The beauty of the villa is that you can experience this without leaving (unless you want to for a day trip) and enjoy it every day. Yes, I truly believe we had found the pot of gold at the Edge of Paradise. We will be back!! 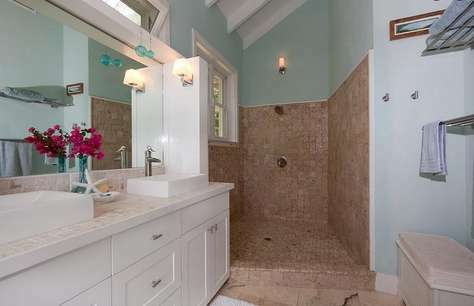 Truly something for everyone at this luxuriously comfortable spacious home. Surrounded by lush flora on three sides, the fourth provides one of the most magnificent water views we've seen.Through clear water we watched from the veranda as ocean life entertained us around the coral reef. Snorkeling with them was great fun. We kayaked to world renowned Magens Beach and relaxed on the pure white sand. Heaven! Fish Tacos anyone? Head to Hull Bay, one bay North. Eat in? 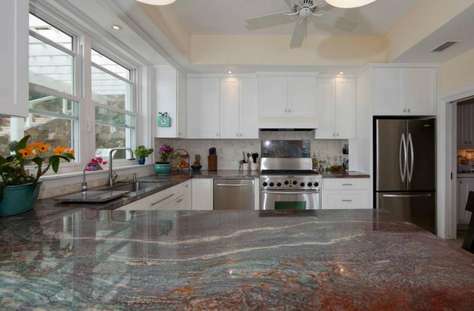 The kitchen and dining area rival most homes, not only the cooking/ eating areas for their amenities but for the VIEW through the wall to wall windows and French doors. Shop or people watch at the bustling Harbor or enjoy another view from Mountain top. We swam,walked, shopped, ate,explored, kayaked,snorkeled, relaxed and took in the awesome night sky. I know it's been said before but, we will be back. Having a very busy year at our jobs, my wife and I looked forward to spending some down time with the family on St. Thomas. We had looked at a few villas but thought having the ocean close by and a pool for the kids would give us more time to relax. With my brother and Mother-in-Law joining my wife, 4 year old son, six year old daughter, and myself visiting the island, it made for a diverse group. We wanted a zero stress vacation, and the Edge of Paradise certainly filled the need. To me, the best part of the property was the rocky shore below the house. Listening to the waves break on the rocks while watching the sunset over Magen’s Bay was absolutely therapeutic. Every night after the kids went to bed; we would mix up a cocktail and meet on the deck to relax after a ‘hard day’ on the beach or in town. Also, with the main bedrooms facing the water, listening to the surf would just lull us to sleep at night. The property is fully air conditioned, but we found the breezes at night and the windows open kept us comfortable (and better to hear the ocean!). However, because of the number of windows, I would recommend anyone that is not a morning person to bring a sleep mask. The Property Managers were very attentive and available, not that we needed her much because the house was so well equipped. Her occasional advice that was always helpful, with the most important advice being to get a jeep to get to the villa. Being right on the water and leaving the main road at about 500-600 feet of elevation, it made for some interesting driving to get down to the property. 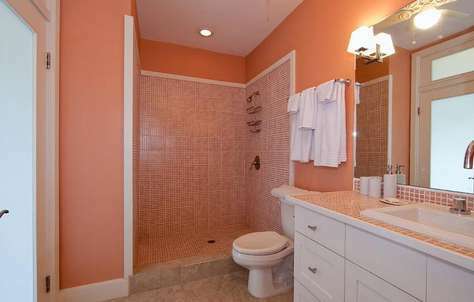 But this also gave an incredible amount of privacy. When you arrive and go through the gate, you have your very own secluded compound. Having an engineering background as well as some general contracting experience (my brother has also been in the construction industry for 30 years) made us appreciate the property even more. The thought put into the design of the structure and grounds was outstanding, and workmanship was very good. 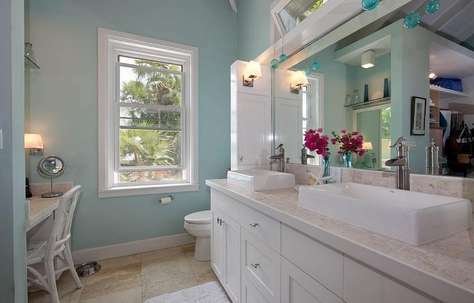 We admired the stone, tile, and wood work, which had great quality without ostentation. The furniture was all very solid and functional, complementing rest of the property. 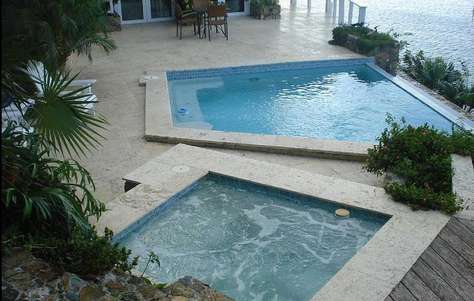 The villa also has a generator which did come in handy one night when the island lost power. In all, it was a great week. My stay at the Edge of Paradise was absolutely perfect. I knew ,going in, how beautiful the island of St. Thomas was but to stay in such a luxury home that was so private yet a 10 minute paddle to the most beautiful beach on earth(Megans Bay beach) was a dream! Being able to watch the kids snorkel along the reef from the front porch, while grilling the evening meal was incredible. The ability to stay there was more than convenient, it made it a vacation, with no reason to leave(except for sight seeing on the island). The home layout was perfect for us, with the pool and hot tub overlooking the breath taking water,and plenty of room for us all. I cannot describe the feeling of falling asleep to the sound of the waves and the tree frogs;then waking up to the sun, and seeing the turquoise blue water from my bed.......enough reason to book another stay! Having never experienced anywhere like St. Thomas, I went into this vacation not knowing what to expect. I was hoping for a nice relaxing week with some great friends but I left having had a week that I will never forget. I'm sure there are many great options for places to stay on St. Thomas but the Edge of Paradise went above and beyond in accommodating all our needs. The bedrooms were the perfect size for multiple people to stay comfortably and the kitchen had everything necessary to make dinner for a large group. I had to do some last minute things for work and the Wi-Fi was great - I could have gotten used to checking my email as I overlooked the coral reef from the porch. The owners of the house offer snorkeling equipment and access to their kayaks, which made the vacation perfect. Being able to snorkel in the coral reef right below the home was amazing. I have kayaked in various lakes and rivers in New York, but the opportunity to kayak in Megan's Bay was one I could never pass up. The beautiful staircase led from the house right down to the beach where we launched. We used the kayaks to take ourselves around the Bay and right to the beach where we swam, laid out to get sun, and walked up the nature trail. This location offered the perfect private getaway and went above and beyond in providing whatever we needed to enjoy everything the island had to offer. 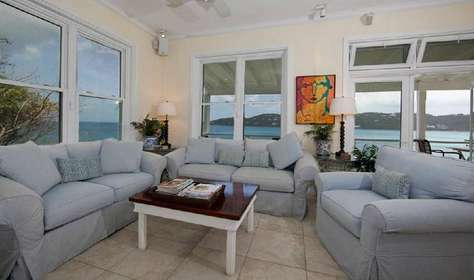 If I had the opportunity to go back to St. Thomas I would only go if this home were available. As stunning as the pictures of the Edge of Paradise on the website are, the reality is twenty times better! As I spent an idyllic week there, I speculated that this is how Hollywood celebrities must de-stress. If you’re looking for a real break, an opportunity to rest and reflect, then this private, secluded oasis has it all. For spectacular views, the Edge of Paradise boasts an infinity pool, a hot tub, and full length balconies overlooking picturesque Magens Bay. To immerse yourself in the flora and fauna of this lush island, walk down to the private pebble beach, marvel at the beautiful coral, snorkel among the colourful fish, and kayak the length of Magens Bay. If you’re a foodie, the modern kitchen has all the conveniences, or make use of the impressive barbeque or wood-burning pizza oven (what a treat!) to cook up a storm. Our party of four adults had a spectacular, unforgettable stay. 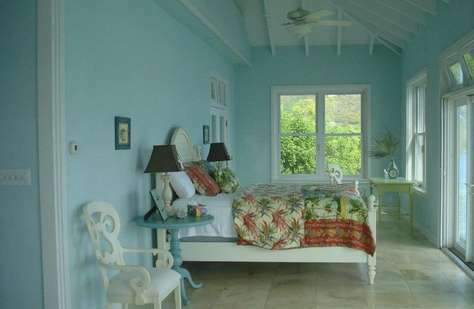 With a breathtaking view of Magen's Bay, amazing coral reefs to explore, and a quiet atmosphere to relax and enjoy the stay, Edge of Paradise delivered on all expectations and still left me breathless. Upon arriving and first catching a glimpse of the house, it was immediately better than I was expecting and I knew that there would only be good things to come. The whole house breathed comfort, relaxation, and the true definition of vacation. Walking outside onto any of the decks and seeing the waterfront with the reefs was always a perfect start to the morning. With easy access to the water for kayaking, snorkeling, and swimming, this Villa was perfect for underwater excitement and adventures. The walk down to the water was very easy, especially with the very new looking deck and stairs! The coral reefs were stirring with life, from many colorful fish to lobsters, crabs, and even a sea turtle!! We took a kayak to the beach at Magen's Bay (a very easy paddle) and enjoyed a walk on the white sandy beach. One day, we were even daring enough to snorkel and swim our way down to the beach! No matter what bedroom you were in, you didn't miss out on any amazing views of the natural surroundings or the water below. With the infinity pool looking right out over the water, it was a perfect place to relax in the middle of the hot day and still take in the sights. The week spent here was better than I could have ever expected, and the accommodations were just as amazing. All in all, Edge of Paradise was better than described, and then some. It was a great trip and I wouldn't hesitate to stay here again. We initially thought the "Edge of Paradise" was cliche but as soon as our family arrived, we realized that we were immersed in paradise. It was even more amazing than described. No matter what room you were in or where you looked, this property allowed its guests to be fully integrated with the beauty of the natural surroundings. The wall of windows created a sense that we were next to the water at all times and we had never seen such beautiful blues. The best part was the view from the patio overlooking the infinity pool. 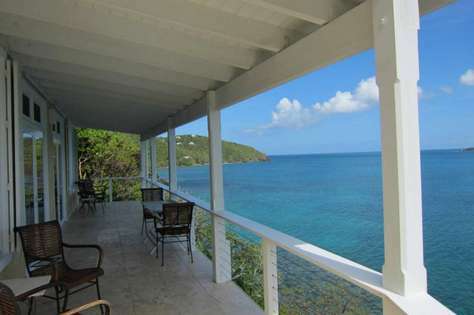 The extensive decking allowed us to enjoy the spectacular views of Magen's Bay and the surrounding shoreline. After walking down the stairs (which looked brand new) of the property, we were able to easily access the water for snorkeling. Our daily underwater adventures were full of sea life (colorful fish, brittle stars, turtles, and even an octopus). The only drawback was that you are not allowed to bring any of these treasures home. By the end of our visit, we developed a new appreciation for these creatures and were content to leave them in the beautiful waters they call home. We also kayaked over to Magen's Bay (it was an easy trip) and enjoyed the powder white sand. Initially we were concerned that we might miss out on the ammenities of a resort poperty; however, our experience was to the contrary. 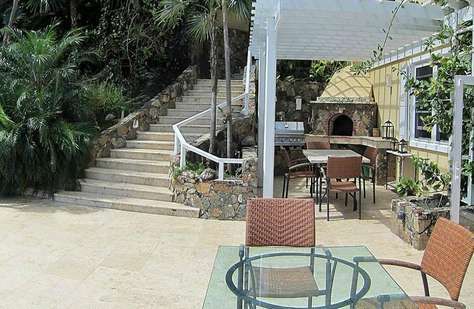 This villa is filled with luxury, top of the line craftmanship and well appointed furnishings. The beds were heavenly. Instead of waiting for a table at a crowded restaraunt, we prepared our meals in the deluxe kitchen and watched the sunsets. We did rent a vehicle for going into town (duty free shopping, ice cream, and fish tacos at Hull Bay). Overall, this will be considered one of our most memorable family vacations and we highly recommend this property!!! Paradise amongst the verdant tropics.This spot has it all. Off the beaten path, framed by lush plantings and bounding seas/ sea green bay. we snorkeled, kayaked, hiked, swam and marveled at the aquatic life, all the comforts of home plus. A definite come-back-to place.